Chris Sharma: A Sense Of Place from Prana Living on Vimeo. Adventure: Are you still deepwater soloing these days? Chris Sharma: I am here in Mallorca [Spain] doing some deepwater soloing right now. I haven't been here for a while. I've really gotten into sport climbing over the last few years. I actually have some good friends from Santa Cruz, California, who are visiting. I've been giving them a tour. And we've been doing some deepwater soloing. It's really cool for me to come back to Mallorca. What does Spain have to offer a rock hound like you? CS: I live in Catalonia, the province of Lleida, in the foothills of the Pyrenees. It's a really special place right now. In the 1990s southern France was the epicenter of sport climbing. Everyone around the world would go to the south of France. That was where the best competitions were. That's were the standards were being set. And now that has moved to Catalonia. That has to do with me living there, establishing a lot of the hard routes. But then, just in general, it's really an international epicenter. Everyone goes there. It's where all the hardest climbs are right now. The grade 5.15, which is pretty much the highest level out there, there are a handful of these routes around the world. But 90 percent of these routes are in Catalonia in Spain. Who better to follow in 140 characters or less than our favorite explorers? We've put together a roster of tweeters, from eco-activist David de Rothschild to alpinist Ed Viesturs, to keep an eye on the ever-changing world of adventure. This list is by no means final, so keep checking back to see who's been added. And, as always, tell us who we left out in the comment section below. We're particularly interested in adding gear manufacturers, conservation groups, and outfitters that are tweeting, so if you're out there, let us know. See the full list after the jump. Paddleboard Racing: The Hardest Adventure Sport You've Never Heard Of? Paddleboard racing is the hardest adventure sport you've never heard of, which makes Australian Jamie Mitchell the best athlete you don’t know. On Sunday, July 26th, Mitchell won the unofficial world championship of the sport – the 32-mile Rainbow Sandals Molokai to Oahu Paddleboard Race – for a record eighth consecutive year, clocking in at four hours, 58 minutes and 25 seconds. While such dominance is almost unheard of in any sport, it is especially impressive in Mitchell’s case, due to the nature of paddleboard racing in and the difficulty of the Molokai to Oahu race. After years on the fringes, parkour finally seems like it is breaking into the mainstream. Training camps and local groups are popping up all over the country, and suddenly the impossible—i.e. leaping across buildings in a single bound—seems possible. L'art du déplacement (the art of movement), as it’s called, is about training your body to overcome obstacles in your surrounding environment—from branches and rocks to rails and concrete walls—quickly, efficiently, and smoothly. And, of course, it looks ridiculously cool. See for yourself, with our list of the top 10 best parkour videos out there. As the Olympic torch draws closer to Beijing, where the beacon will signal the beginning of the ancient games on August 8, athletes from around the world are arriving in China for their final days of preparation. And if this year's Olympic trials were any indicator, we will see some amazing feats of athleticism—and broken world records. While these records only compare how fast, strong, or agile humans are against each other, imagine if we compared our abilities to the other inhabitants of this big blue marble we call Earth. The fastest 100-meter freestyle swim by a human was clocked by Alain Bernard of France at 47.5 seconds on March 22 at the European Championships. That time translates to nearly 5 mph, a slow crawl compared to the marine world. According to the Reefquest Center for Shark Research, Bernard could out-swim an eel (2.4 mph) and barely keep up with a sea trout (5.4 mph). But when it comes to the big players, no human on Earth would win a race with the bottlenose dolphin (17 mph), the mako shark (31 mph) or the killer whale (34.5 mph). To check out what speeding along on the back on a seal looks like, watch National Geographic’s Crittercam. The world record for swiftest 100-meter sprint was set on May 31 by Usain Bolt of Jamaica at 9.72 seconds. Convert that to mileage and this man can run an astounding 23 mph. Pair him against a chicken, squirrel, or black mamba snake and he will win every time; their speeds clock in at 9, 12 and 20 mph respectively. Compare Bolt to a grizzly bear or a house cat (both can run up to 30 mph) and he is left in the dirt. Not to mention a lion (50 mph) or a cheetah (70 mph). But according to scientists at the University of Manchester, who have calculated the running speed of the Tyrannosaurus Rex at 18 mph, Bolt could outrun the 6.6-ton megabeast. To find out more land animals speeds. Javier Sotomayor of Cuba is the world’s highest jumper with a lofty 8-feet leap in 1993. If Sotomayor were 6 feet tall, his jump would equate to 1.3 times his height, whereas the spittlebug (the world’s greatest jumper) can jump 100 times its height, or 28 inches. That’s equivalent to a human jumping over a 690-foot building. Want to learn more about the spittlebug? But just when it seems that humans can’t compete with the rest of the animal kingdom, just remember: we have planes, trains and automobiles that can take us faster and higher than any animal alive. The lures of the beach are hard to resist come summer. But this season a raft of perils (Shark attacks! Riptides! Jellyfish invasions!) seems poised to storm the coast and shift the action from surfing and sea kayaking to chicken fights and Marco Polo at the community pool. Last year, in fact, saw more than 25,000 beach closings or swimming advisories—a 28 percent increase from 2006, according to the Natural Resources Defense Council. What’s more alarming is that an estimated seven million people get sick every year after visiting the nation’s 3,500 beaches. But that’s no reason to forsake the sand. Here, what the experts say is lurking out there--and what you can do to maximize your time in the sun. Flipping through Surfer Magazine goes something like this: blue, blue, blue, blue, blue, blue, shocking lime green, blue, blue, blue. 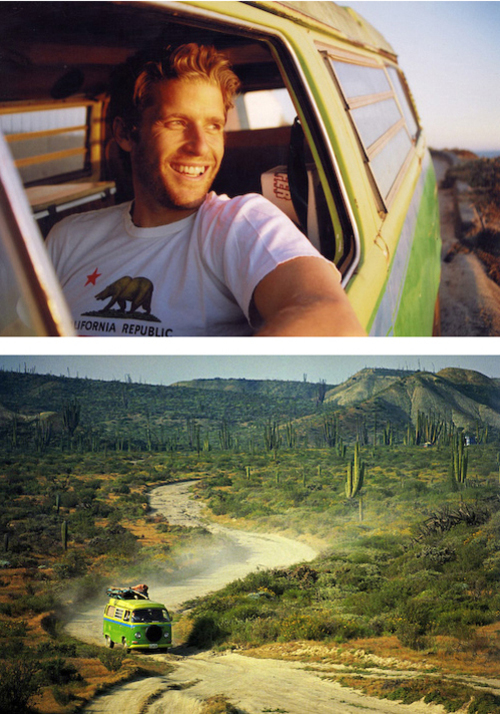 There in each issue, jumping out from Surfer’s sea of epic waves and countless board short ads, is a rusty but glowing, chartreuse 1972 VW camper van, the icon and motorized doppleganger of Curious Gabe, Gabe Sullivan, who, every month, poses to ten complete strangers the kind of existential questions you’d expect to be asked in the pages of The Atlantic Monthly or in a dorm room at 1 a.m. Questions like, Does surfing improve with age? 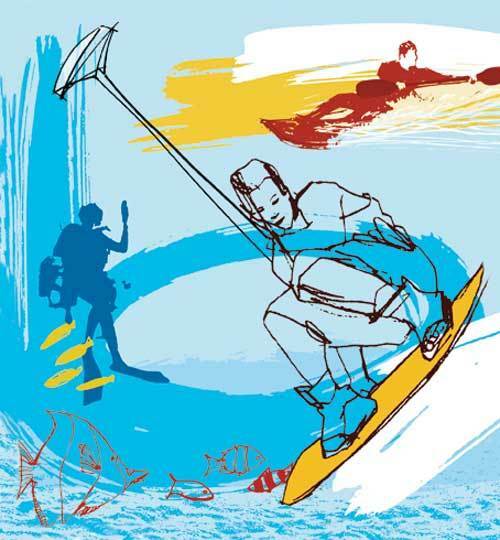 Would you rather be an East- or West-Coast surfer? And, a real brain scrambler, What’s worse—being a hoser or a poser? With its 2008 incarnation now touring theaters around the globe, the Banff Mountain Film Festival is generating a web buzz as well. Users on our favorite guilty pleasure video sharing site, YouTube, voted last year's trailer promoting the festival's Radical Reels category one of the best sports videos. With almost 26,000 views, 2007 Radical Reels video is a dramatic montage of outdoor action sports featuring athletes in some of the most extreme conditions imaginable--underground ice cave climbing and downhill mountain unicycling to name a few. But there's substance, too: The trailer also shows snippets from some of the festival’s longer, more thought-provoking films to counterbalance the archetypical footage of daredevils' antics that we love to watch. Still undiscovered by the YouTube audience (for now, at least), the 2008 Radicals Reels trailer (which we embedded above) is definitely worth a watch. This year's films can be viewed in their entirety during the Radical Reels tour, hitting 13 states and four Canadian provinces this year.